As promised, we were able issue a FOIA to get a copy of the September 22nd presentation from the South Loop Town-Hall meeting at McCormick Place. At that meeting, CDOT Representatives were on hand to discuss the project, listen to complaints, concerns, and feedback from residents in regards to the Roosevelt Road project impact. 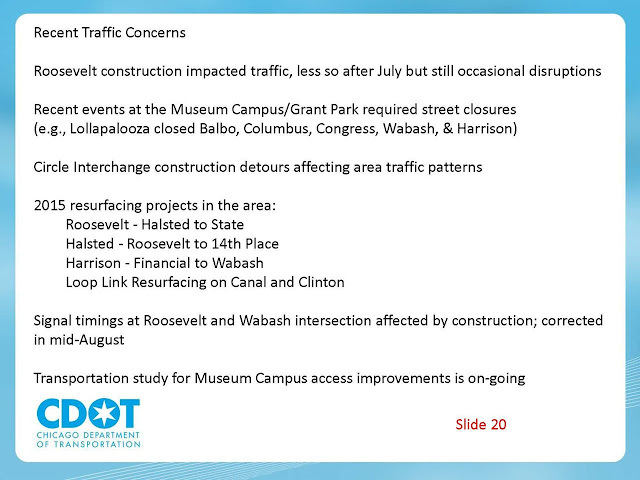 CDOT also discussed what it has done (correct traffic light timing errors), and what they are reviewing to address, as well as provide and overview of the remaining work on the project. Worth a read if you're one of the people who questions why this was done. And for those wondering, the street markings are supposed to be done by the end of the year.